Otzi the Iceman never stops giving. 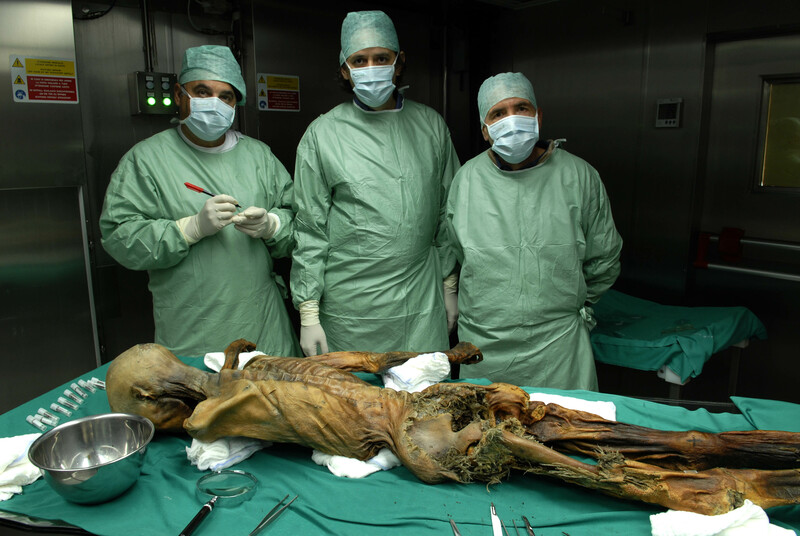 The 5300-year-old mummy found embedded in the ice of the Ötztal Alps in 1991 has been an endless bounty of information about prehistoric man ever since. His latest gifts are red blood cells preserved in tissue around his arrow wound and hand laceration for more than 5000 years. Blood cells degrade fairly quickly after death, and previous scans of the Iceman turned up empty. Researchers used state-of-the-art atomic force microscope technology to scan the surface of tissue samples. A tiny metal probe just a few atoms wide is dragged across the sample. Sensors attached to the probe track its movements, detecting even the smallest unevenness in the surface and creating a 3D map of it in enormously high resolution. They found cells the size and classic donut shape of healthy, recently-dried red blood cells. 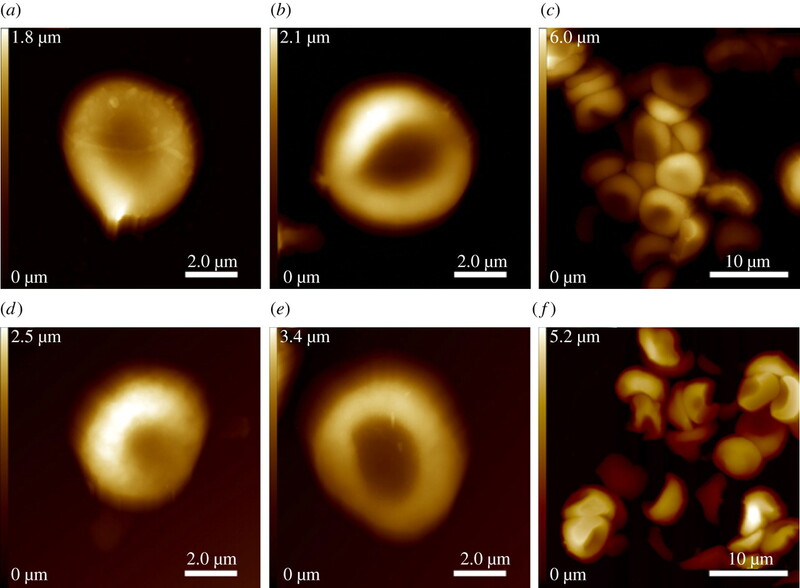 They confirmed that the samples they found were red blood cells using the Raman spectroscopy method in which a laser illuminates the tissue and examination of the spectrum of the resulting scattered light identifies the molecules doing the scattering. Had the cells been pollen or some other substance, researchers would have been able to tell. Instead, the spectra revealed bands characteristic of the protein hemoglobin. They were an order of magnitude weaker than the bands you get with fresh red blood cells indicating a decrease in hemoglobin due to degradation of the cells. The laser also found fibrin, a protein found in fresh wounds that helps blood to clot, in the sample from the arrow wound. Fibrin is only present in fresh wounds, which confirms that Otzi died shortly after being hit with the arrow instead of several days later as an earlier theory held. Despite some degradation, the red blood cells were remarkably well-preserved. “They really looked similar to modern-day blood samples,” said Professor Albert Zink, 46, the German head of the Institute for Mummies and the Iceman at the European Academy in Bolzano, the capital of Italy’s German-speaking Alto-Adige region. “It is very interesting to see that the red blood cells can last for such a long time,” he said. “This will also open up possibilities for forensic science and may help lead to a more precise determination of the age of blood spots in crime investigations,” he added. Their research has been published in the Journal of the Royal Society and is available to read in full free of charge. This entry was posted on Wednesday, May 2nd, 2012 at 11:53 PM	and is filed under Ancient, Modern(ish). You can follow any responses to this entry through the RSS 2.0 feed. You can skip to the end and leave a response. Pinging is currently not allowed. Although my writing is based in history, I’m not a competent historian: I wonder if looking at the blood cells allows them to determine any information about human diseases at that time…. I wonder the same. They already identified lyme disease from Otzi’s genome. Who knows what else they’ll find as technology improves? That’s an excellent point, Shelley. Perhaps this find will provide us with significant medical knowledge to someday cure a terrible disease! It amazes me that scientists can continue to make use of a specimen collected more than two decades ago. Kudos to them! This is really fascinating. There are different causes for mummification and one of the ‘archaeologically’ most effective ones seems to be indeed frosting. It took the scientists almost 10 years to find the bullet/arrowhead, however, by now they seem to be able to tell the valley that he grew up in (Eisacktal, by dental mineral status), to source metal in his hairs (alluding to a metallurgic profession), to identify his haplogroup and entire genome (his genetic roots), to inspect his general pathology etc. By (inhaled?) pollen they seem to be able to trace his last 24h, and at least 24h before the fatal shot he was apparently having a fight. His outdoor equipment seem to be adequate for alpine travelling. The position of his left arm indicates that he fell on his back having received the bullet, he received a blow to his head and then his body might have been turned around – possibly to unsuccessfully rescue the valuable arrowhead. Remarkably, the attacker left his even more valuable metal axe untouched. This is an interesting article and very informative. I love learning about stuff like this and I have also been in chemistry and how different solutions work. I recently have been studying about blood cell research. Its amazing that products like Hematology Stains can have such a great affect.